The company Century is a novelty - Mogul Alexandrite: luxury and refinement. All brand Century announced the release of a new model of Mogul Alexandrite Ref. 636.7AFN5P.58.CYK. All brand Century announced the release of a new model of Mogul Alexandrite Ref. 636.7AFN5P.58.CYK. Rock with unique properties chameleon, began to serve as a decoration for a luxurious new housing additions to the landmark line of Mogul. Large alexandrite basking in the warm sun caresses of the sun, shining a flickering flame in the fire: it changes color in any light. In daylight, it gets a blue-green color, somewhere between the color of a blue lagoon and peppermint liqueur, while in artificial light, he gets a shade of amethyst, like a coquettish lady-changing outfit in the middle of the day. In search of a new method of poetic expression in the roots of which lie the eternal feminine beauty, the company used a master jewel, transparency and excellence which creates a special magic. Perfect mastery of watchmaking possible to create a chromatic version of the new items. Large Alexandrite made in cutting roses and has 192 faces. Rare in its beauty model Mogul Alexandrite Ref. 636.7AFN5P.58.CYK was conceived as a magnificent piece of jewelry. In case of red or white gold fitted with a new face, adorned with 48 diamonds, but the “ears”, by which alligator strap attached to the body, have the form of a predator claws that seem to protect the precious stone. “Ears” also paved with 45 diamonds. The total weight of diamonds 0.323 carats. Model Mogul Alexandrite Ref. 636.7AFN5P.58.CYK designed based on a quartz mechanism. The introduction of limited. 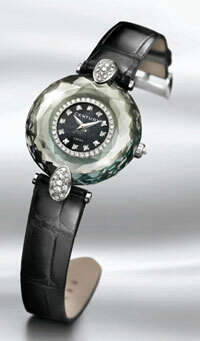 Buy watches may have official representatives of Century.